The first day of Summer will bring the first harvests of red tomatoes, a Farm to You BBQ, and plenty of blueberries, blackberries, and peaches! Spreading Oaks and Five Cedars Farm have the red tomatoes. Five Cedars is harvesting the first of the peppers along with red onions. Morning Glory Farm's blueberries are in and look for blackberries from several farmers including Spreading Oaks and Footehills Farm. 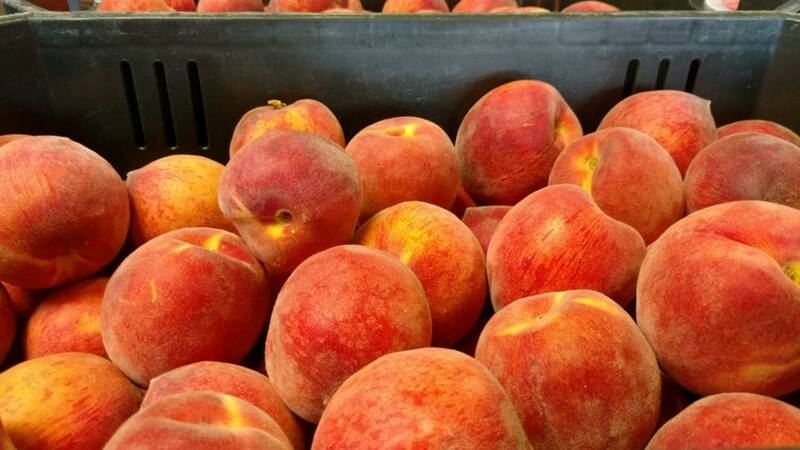 Fitzgerald Fruit Farm will be there with peaches and the BBQ will have the peach cobbler! Squashes and zucchinis are in abundance along with cucumbers. Bella Vita Mushrooms has oyster mushrooms both pink and golden, along with wild mushrooms and Quiet Acres will be back this week with lettuces and the first of Brandon's summer crops. Donna with Jeffers Homestead will be coming to market for the first time this week. Be sure to stop by and Welcome Donna to market and check out her vegetables and baked goods. Stop by Donald's and see if his red tomatoes are in yet, and Morning Glory Farms has pork, chicken, and lamb along with baked goods and jams, jellies, and syrups. Ms. Sue has a wide variety of canned goods from chow-chow to pickled eggs to soup base. She also has fresh vegetables, baked goods, and pet goat milk products. Chef Suga's pimento cheeses, hummus, and pot pies will be available and Jana will be at market with her breads and baked goods. Ms. Adriana with Timberland Farms has grass-fed beef cuts. Robilland Farms has pet cow milk products and fresh ground wheat bread and several farmers have fresh eggs. Footehills Farmhouse has pet goat milk products along with her fresh vegetables, herbs, and farm made soaps and bath products. Be sure to try her new pizza crusts. Dewey's fried pies will be there and Radicle Root will be back with Courtney's botanicals and teas. Stop by the green market tent to check out the cooking demo focused on Bella Vita Mushrooms and get the recipe. The Farm to You BBQ will be available as long as supplies last. Plates are $15 and include pulled pork, fresh made coleslaw, squash casserole, pickles, chow-chow, and a fresh baked roll. Dessert is peach cobbler and of course plenty of sweet tea and BBQ sauce.